The user scatters a cloud of poisonous dust on the target. This may also poison the target. The user drenches the target in a special poisonous liquid. 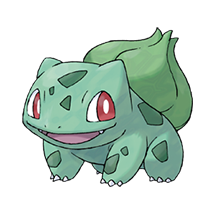 This move’s power is doubled if the target is poisoned. The user temporarily empties its mind to forget its concerns. This sharply raises the user’s Sp. Def stat. The user turns the ground under everyone’s feet to grass for five turns. This restores the HP of Pokémon on the ground a little every turn. The user lays roots that restore its HP on every turn. Because it is rooted, it can’t switch out. The user whips up a storm of leaves around the target. The attack’s recoil harshly lowers the user’s Sp. Atk stat. The user violently whirls its vines or tentacles to harshly lash the target. A column of grass hits the target. 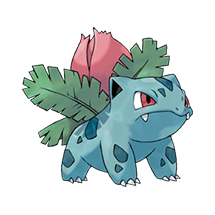 When used with its water equivalent, its damage increases and a vast swamp appears. The opposing Pokémon are bound with silk blown from the user’s mouth that harshly lowers the Speed stat. 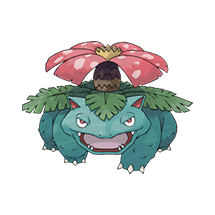 What do think about Ivysaur?